A dog grooming table is a useful piece of equipment for professional groomers and owners who like to take this task on themselves. Rather than having to do the job on the floor, it is so much easier if your pooch is secured onto a grooming table. You won’t have to bend down all the time and you have a sturdy place where your dog can sit. Plus, if you use a table, your dog will naturally associate this with grooming, and you can better prepare them. But before you invest in a piece of equipment such as this, it is worth knowing more about some of the best products out there, as well as their key features. And here we are to help with our detailed product guide of the best dog grooming tables. Getting your dog to stay while you are grooming them can be tough, but this table offers a solution with the attached grooming arm and leash loop. The pebbled, non-slip surface ensures that it stays firmly in place during grooming. As for the legs, they are strong and sturdy. The top layer is waterproof to prevent absorption, which makes the task of cleaning the table so much easier. When you want to store the table away or transport it from place to place, you can do so by simply folding up the legs. A couple of different sizes are available, so make sure that you measure your dog and choose the right one before investing any money. This small dog grooming table is 18 inches in diameter and specially designed for petite pets. It is made to be placed on other surfaces, so you don’t have to bend down so much. The top of the surface is non-slip, and there is a grooming arm to ensure that your dog will stay in place. Three different colors are available, so you can choose the one which best suits your pet grooming table. One of the best features of this grooming table is that it spins around, so you don’t have to worry about putting your pet in different positions. This bone-shaped table has a non-slip rubber texture. When you need to clean it, all you need to do is wipe it clean. As for the frame, it is made from stainless-steel which is entirely rust-resistant. The adjustable and foldable grooming arm with a noose and loop keeps them in position. Grooming your dog involves using a lot of different equipment, and all of it can be kept in the storage basket underneath. Choose between three alternative colors to ensure that the table is a stylish addition to your household. When you get this grooming table home, you don’t have to worry about any complicated installation as there are no tools required. The H-frame with two nooses is designed to keep your pet firmly in place as you complete all the required grooming activities. The texture of the table surface is made from waterproof material with a non-slip texture to keep them standing stable. It is also static-free to ensure that no hair, dirt, and debris sticks to it, which makes the job of cleaning it so much easier. 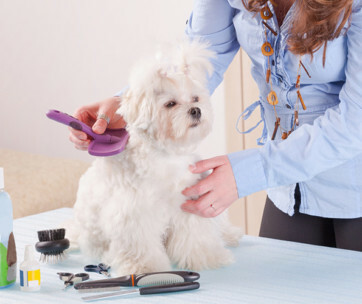 Obviously, whenever you are grooming your pet, your number one priority is to keep them safe, and the rounded corners of the table help to ensure this. This grooming station is extremely straightforward to set up and fold away as needed. But even though it is easily foldable, the construction is made of thick metal for strength and stability. The surface provides a soft place for your pet to get comfortable, and it is also non-slip, which adds an additional level of practicality. As for the arm, it is fully adjustable, so you can attach your pet and give them as much freedom to roam as needed. This pet grooming adjustable connector bar is designed to attach to a table between 36 to 48 inches. It comes with two grooming nooses, which keep your pet firmly in place while you undertake the task of grooming them. 12 placement options are on hand, so you can choose the position based on your dog’s comfort and the grooming task that you are undertaking. If you have the table already, this dog grooming arm makes a nice addition to it. 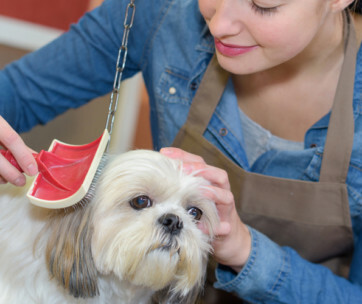 Worried about your dog slipping off their pet grooming table? Well, this one features a board which is made from high-quality rubber with skid resisters for stability. It is also static-free to stop hair, debris, and dirt from sticking to it. Rust-resistant stainless-steel makes up a big portion of the table, including the legs, which have rubber soles for stability and to prevent floor scratching. The weight limit is 250 lbs, so it is suitable for most dogs. There is a useful storage basket at the bottom where you can keep all your dog grooming supplies. As well as being easy to assemble, it also folds away compactly, so you don’t have to worry about it taking up a huge amount of space in your home. This dog grooming stand is relatively simple in its design. The adjustable grooming arm clamps on, while there is also a nylon grooming loop to keep your dog in place. All of the measurements are clearly listed, so make sure to take them all into account, and measure your dog properly before purchase. It can accommodate dogs weighing as much as 330 lbs, so this is unlikely to be an issue. There is also a tray at the bottom where you can keep all your grooming supplies as needed. At the premium end of the scale of dog grooming tablets, you have this one which features an accordion lift electric design. You can adjust the height between 12” and 48” only using the foot remote. It will accommodate dogs weighing up to 320 lbs. The board features easy-to-clean textured pebble with rounded corners providing extra safety. On the corners are hooks for you to hang your equipment. You will need to buy the overhead grooming arm separately if you need it. The last product on our list is this professional-standard, heavy-duty which is suitable for all your different dog grooming needs. The rubber feet at the bottom add an extra level of stability, while the rounded edges of the table make it less likely that your dog will get injured. 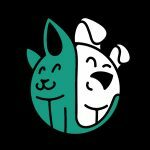 Two nooses are available to attach your dog to, while the frame is fully adjustable depending on the size of the pooch that you are working with. The construction is heavy-duty, but it is also foldable, so you can store it away wherever you like. The next part of our post is the buying guide section. Here, we will talk more about the individual qualities which make a great dog grooming table. Following on from this, we will provide you with some advice on how to deal with difficult dogs on the table. The next section answers some of your most frequently asked questions before we conclude with a recap of our number one product on the list. Dog grooming tables aren’t only made for the professionals; there are plenty of owners who can benefit from investing in one of their own. There are plenty of qualities which make a good product, and here are some of the features which you should be looking out for. Perhaps more important than anything else is making sure that you select the right size of grooming table. Measurements are usually given in inches and indicate the length of the longest side of the table. If you are given the choice of too big or too small, it is always better to go with the latter. Otherwise, your dog won’t fit on the table comfortably and there is more of a chance that they are going to slip off and hurt themselves. Another highly important consideration of choosing a dog grooming table is getting the correct weight. For the bigger tables, this is generally quite high, so it is less of a problem. However, if you choose a smaller table top grooming station, the weight limit is likely to be more important. And it can’t hurt to weigh your dog to be sure anyway. Stability is an important feature – particularly if you have a dog who hates getting groomed and is likely to struggle around somewhat. So, look for grooming tables with big, thick legs and non-skid bases. Also, check the material on the surface of the table to see whether this is non-slip. If you are a professional dog groomer, you will probably be looking for a different kind of table than if you are a casual, at-home groomer. In your house, you are unlikely to have a huge amount of space, so it is preferable that you choose a table which is lightweight and collapsible. You can simply find an area to put it away. However, if you are a salon groomer, you will probably want to be able to accommodate larger dogs. Otherwise, you will put serious restrictions on your clientele. You may want to consider a electric or hydraulic grooming table. Are there any features which make the table adjustable? In terms of height adjustability, it is usually the hydraulic and electric models which have this feature. As for the grooming arm, it should be height adjustable on all tables to suit the size of your pooch. Also, you want it to be comfortable for your dog to shift into sitting, standing, and lying positions. Some tables also rotate, so you can easily groom your mutt at a range of different angles. If you run a professional grooming service and need to get from house to house, it is especially important that the table is portable. Often, these are the more compact tables which feature foldable legs. Also, if you don’t have a huge amount of space on your home, it is better to choose a table which folds away easily as this will make it easier to store. A lot of the features which we have already discussed contribute towards safety. For example, making sure that you choose a table which is the appropriate size and weight. The materials are also important in ensuring that the table is tough and durable. You could also look out for features like rounded edges, which help to stop your dog from getting poked. When you are grooming your dog, things can get a little messy, so it makes your life a lot easier if you choose a table which is easy to clean. The majority feature a waterproof rubber surface, which makes it easy to wipe down after every single use. Also, look for a table which is static-free to ensure that it does not collect hair and dirt so easily. Your budget is bound to play a role in your decision-making. 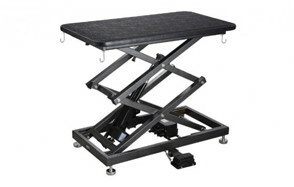 If you have a limited amount to spend, it is likely that a folding grooming table is your most viable option. If you have more cash, a hydraulic table may be within your reach. And if you have a few hundred dollars more, you will be able to get your hands on a professional-standard electric table. While the brand isn’t always everything, it often does give you a clearer indication of quality. Check the company website for their credentials, their years of service, and how long they have been in business. Also, this gives you a good opportunity to check the customer reviews to see what other people are saying about the brand. Often, you can use these as a way of getting the information that you wouldn’t otherwise have access to. Some dogs are harder to groom than others, and this is usually due to feelings of anxiety that they are suffering from. Some struggle to relax, whereas others can’t stand the process at all. From your dog’s point of view, they are suddenly confronted by a completely alien set of tools, some of which make loud noises. This is why it is so important to familiarize your dog with all of the equipment that you are planning on using beforehand. First off, you should try to choose a time when your pet is feeling at their most calm. Perhaps after they have just eaten or following a long exercise session. Now, you can put them up on the table. Make sure to offer plenty of praise and encouragement during this entire process. Attach the restraining loop to their collar to keep them in place. The quick-release should stop them from getting hurt if they try to jump off. However, most dogs tend to remain still if you have secured their collar. 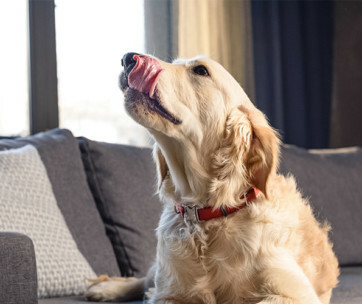 When you are first trying to get your dog to stay in place, you can use treats as an incentive. If you have someone else to feed your dog the treats, this makes things so much easier, as you can concentrate on the grooming. To start off with, you may have to offer the treats on quite a regular basis – as often as every 30 seconds. You can then start working your way up to several minute intervals. Start by brushing your dog’s coat, before moving onto the more difficult areas of their face, ears, paws, and tail. One of the more challenging tools to use is the clippers and it may take some time before your canine companion is fully used to the noise. If you use shears, hold them up, so your dog can see and inspect them before use. Over time, your dog will hopefully relax and get used to the process. Ideally, they will even start to enjoy it! If you are still having a lot of trouble, you may have to consult with your vet about sedation aids. They will advise what to use, how much to administer, as well as answering any questions. You should try your mutt out on a dose beforehand to see how long it takes to work and the length of time it remains effective. This will help in your future grooming sessions, as you will know exactly when to administer it for maximum effectiveness. If you are going to groom them on the table, it needs to be large enough for them not to fall, as they will not have maximum alertness. Now, you should be able to groom them with fewer problems. Bear in mind how long the sedative is likely to last. The main aim is that your dog will become so used to the process that the sedative will no longer be a necessary part of it. Q: Why Groom a Dog at Home? 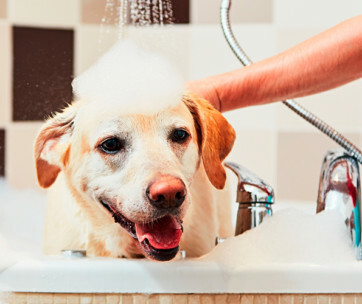 A: There are plenty of direct benefits involved in grooming your dog at home. The first and most obvious is that professional dog grooming can get very expensive and you will save yourself a significant chunk of money. Of course, learning to groom your dog properly at home is an activity which takes patience, so don’t expect to be an expert straight away. Also, as we have already discussed, some dogs are more naturally resistant to this activity than others. If you start at a young age, it gets them used to the activity and makes your life so much easier in the future. Grooming your dog removed dirt, dandruff, and dead hair, as well as bringing out the natural oils in their coat. Regular brushing reduces shedding, which helps to keep your home free of so much dog hair – a relief for any pooch owner! 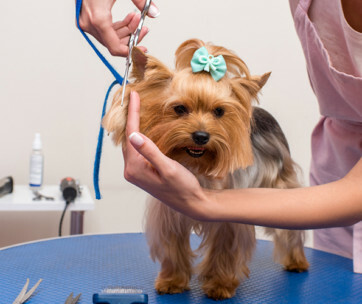 During the grooming process, you have the opportunity to inspect your dog for any abnormalities which suggest that they are not in prime health. Often, when you catch these things early, they are much easier to treat. Finally, grooming your dog yourself is another way to improve the bond between the two of you. While it may not be all that enjoyable at first, over time, it will hopefully become an activity which you both learn to love. Q: Why Get a Dog Grooming Table for Your Home? A: While dog grooming tables are an absolute necessity for professionals, they are a useful addition to any household with a dog. Even if you don’t do the entire grooming process yourself, it is nice to have a dedicated place where you can give them a little brush or trim. 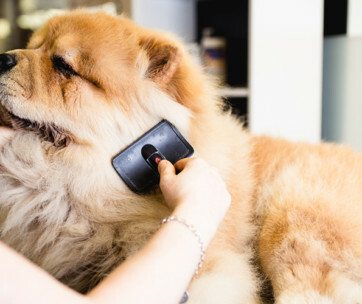 It is especially useful if you have a long-haired breed who needs regular grooming work. Dog grooming tables save you from having to groom your dog on the floor or one of your furniture items. This means you don’t have to bend down all the time, and you don’t have to worry about damage to your expensive wooden flooring or furniture. Another advantage is that dog grooming tables come with built-in devices to keep your dog still during grooming. Some of them are adjustable, so you can easily get your dog into the position you would like without forcing them. Also, they are generally easy to clean when you have finished the job. Finally, they provide an indication to your dog that grooming is about to take place, rather than it being an activity which comes entirely out of the blue. 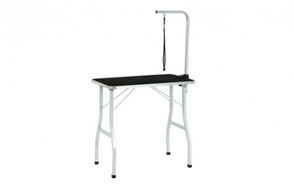 Q: Electric or Hydraulic Grooming Table? A: If you want a more advanced grooming table than the standard manual products, electric or hydraulic are your two main choices. The question of which one to choose depends on your individual priorities and preferences. 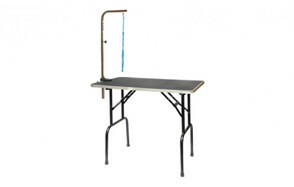 Electric tables tend to be easier to adjust – pressing a button rather than using a foot pump. On the other hand, hydraulic tables don’t require any electricity. This means that you don’t need to connect them up to a power outlet or run a cable up to them. Also, electric tables tend to be the more expensive option of the two, so they are best-suited to professionals or people who take their dog grooming very seriously indeed! Our top choice out of all the different grooming table options is this one from Go Pet Club. The legs are especially sturdy with rubber-capped feet for stability, but you can also fold them away when you need to transport it from place to place. As for the grooming arm, it adjusts to up to 40” in height. All the materials are rust-proof to make it more likely that they are going to stand the test of time. Plus, the surface is static-free to ensure that it is not going to accumulate pet hair.